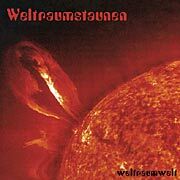 Weltraumstaunen is a German space rock band featuring Dave Schmidt (Sula Bassana, Liquid Visions, Growing Seeds, Zone Six) on bass, drums, synths, organ and guitar, as well as Andi Henrich (Jonas Flux) on guitars, vocals and drums (1track). This record was recorded in April-May 2002 but just came out now in April 2004. It is a beautiful gatefold with a nice fold out insert with very informative liner notes, almost entirely in German. It contains 4 instrumental and 5 vocal tracks that are in general much shorter than the first record. The record begins with Black Doves I, which starts slow and spacey but gets very heavy in the middle. The Finnish band Circle comes to mind. Door’s is a dark 60’s inspired track. Hoffmannsmahl (Dwarves Of Lore) really takes off into space rock territory and my favourite track on side A. Floating In Space is only guitar and synthesizers and is pretty far out into space. Wizard vs. Time is a short number closing side A and has some cool acoustic and electric wah guitar. Introfernale begins Side B with space sounds before heading into the hypnotic Weltraumwelt. This is a great free floating space rock song like CAN used to make. The 14 minute Farfisadelic is a long trip with piano, farfisa, organ, slide guitar and lots of effects! Black Doves II ends the LP much like it began! A trip well worth taking. If you like the music of the first record and the psychedelic rock produced by Dave Schmidt and the folks surrounding him, then you won’t be disappointed with this record! Buy it! For more information you can visit the Weltraumstaunen web site at: http://www.weltraumstaunen.de.